“Winspring”- that weird wardrobe transition between winter and spring that happens throughout a good portion of the United States this time of year. You're tired of your dark winter clothes and boots, but yet it isn’t warm enough to break out those shorts and sandals. You never know whether to dress for the sunny days that pop up this time of year, or for the chilly temperatures we're slowly slipping away from. The anticipation of warmer weather is growing, and sometimes we find ourselves staring blankly into our closets, feeling utterly uninspired. Well, we have something you're going to love! Check out this outfit we've put together that fills both desires - the desire to stay warm and still be springy! Our very own Hillary is rocking a beautiful “winspring” outfit! She's wrapped in warmth and boasting a burst of color! Starting from head to toe, Hillary is wearing an aqua cardigan with a stripe detail over a splatter-paint t-shirt. This allows her arms to be covered from the wind but gives her the option of going without a jacket. Next up are her jeans; Hillary is wearing a Joga-Mid Pencil Skinny by Silver Jeans. They just arrived here at the Village Barn Boutique about a month ago and they feel amazing! They have the comfort and mobility of a sweatpant but the look and durability of a jean--so practical and adorable! Hillary folded a three-inch cuff at the bottom that adds a bit of interest to the look. Now, on to the jewelry! We decided to incorporate Ginger Snaps into the outfit because they are easy and versatile. When you purchase a piece of Ginger Snap jewelry, there are so any options because the snaps are all interchangeable to match with any outfit! We went a bit more neutral so it didn’t take away from the aqua cardigan. 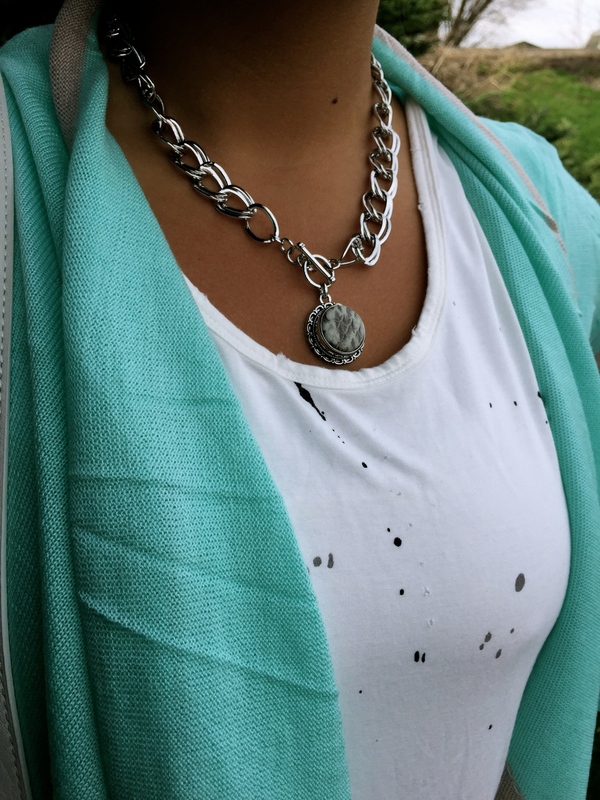 This look is complete with a necklace, bracelet, and ring. Her charming little cross body is the icing on the cake--the edgy studs and fun fringe are a must and perfectly completes the look! Sometimes it’s hard to know what exactly to wear during these transitional times. We hope you now have some inspiration to peek into your own closet and put together an inspired “winspring” looks! Thank you for reading, and stay tuned for more!